This is the beginnings of an article on the topic. While it isn't complete, I thought I would publish it early so others could see some of the information as early as possible. As I described in a previous blog post, my wife and I have been looking for software that might help our son with expressing himself with the written word and mathematical expressions. This particular blog post is going to summarize our experience with a few software packages that can help people express themselves mathematically. Efofex Software is a company creating tools for mainly math and science teachers that enable them to create various mathematical and technical diagrams. They also advertise some of their software products for students. Further, they have a program through the EmPower Foundation where students with physical disabilities (as opposed to the schools they attend) can receive a gift of a 10-year license of Efofex products. They also mention that they will work with homeschool students to get similar benefits. We were able to contact them recently and they granted a license for our son to use - some much appreciated and amazing generosity. Efofex Software seems to have two main packages that they sell: FX MathPack (a yearly subscription of $65 for individuals) and FX SciencePack (a yearly subscription of $40 for individuals). Each is designed for teachers trying to generate diagrams and mathematical or scientific expressions for supporting their classroom work. "For some, the hardest part about math is writing the darn problem." It seems like one of the key pieces of software that can help people with dysgraphia work through mathematical problems is some reasonable method for expressing things mathematically without having them physically write the expressions with pencil and paper. One of the challenges here, though, is to find software that acts like the electronic equivalent of pencil and paper for mathematical expressions and not actually do all of the work for the student in the process. The following software packages are examples of software that can be used to help people write mathematically. One of the first packages that my wife came across was Mod Math, a software package specifically designed to help people with dyslexia and dysgraphia write mathematical expressions and statements for school work. The software runs only on the Apple iPad for now, though, there are some intentions of supporting other systems such as Android and desktop applications. The application is free, but the are ways of donating to support further development. Further, the organization publishing the application also provides a Pro version of the application that has some newer features and also serves to fund further development. The software is designed to help people write mathematical expressions using a grid, which helps them properly align expressions and numbers during calculations - a clever approach to the problem. The software is mainly designed for supporting the calculation of basic arithmetic problems (addition, subtraction, multiplication, and division) as well as algebraic calculations and expressions. At the moment, it does not seem like the software is suited to write higher mathematical expressions, such as those from calculus, set theory, etc. The software provides various methods for sharing the written calculations, including printing the work, uploading the work to DropBox, and sending the worksheets via e-mail or text. I was recently able to try out an older version of ModMath and it worked as expected on the iPad and seemed to work intuitively. If you have an iPad, you certainly should try using this application. What isn't clear to me, though, is if this one application really justifies purchasing an iPad given the other options below if you already have a Mac or PC. For younger students, this might be a must-have application, justifying the purchase of an iPad. Of course, if you need to write higher mathematical expressions (calculus, set theory, etc. ), you will need to use a different notation software package, like those below. My son recently tried to do long division using FX Equation. While it was sort of successful, FX Equation and, probably, most typesetting tools are not geared for the writing out the process of computing a long division problem. In particular, there was no convenient or precise way of lining up the intermediate results for subtraction. By contrast, that is something that ModMath is designed to do. My son picked up how to do it quite easily with ModMath. The older version of the application on an older iPad didn't give him quite enough room to write the computations out naturally (it didn't provide enough rows), but he continued the computation to the right of the problem to complete it. There was a minor typesetting problem in this older version of ModMath but, in general, it proved its value for being able to write out computations for long division. There will be some similar benefits for other computations, like multiplication, addition, and subtraction, though, those are definitely easier to represent than long division in FX Equation. FX Equation from Efofex Software is quite nice for typesetting (or writing) mathematical expressions, something that may be exactly what a person with dysgraphia might need. It does not do any calculations, but it helps a person create mathematical expressions just by typing or using a more point-and-click method. The resulting graphics/expressions can be then pasted or imported into a number of different tools: Microsoft Office (Word, PowerPoint, OneNote), LibreOffice, MathML (for the Web and other uses), and LaTeX. Further, FX Equation is also quite sophisticated in terms of the mathematical notation that it can produce, including the ability to generate many advanced calculus, set theory, and other mathematical expressions. Below is an example of what the tool looks like. The typing method for entering equations is quite natural and should be fairly easy to pick up with a little use. From my perspective as a long-time LaTeX user, one of the great things about the tool is that the "language" for entering in equations is very friendly for new users. Further, the final mathematical expression or equation is displayed as you type, so you can see any mistakes you make. The point-and-click interface seemed reasonably effective and it generates the text-based language for you for creating the mathematical symbols. Again, the final result is displayed as you interact with the tool. While maybe not ideal, I can see a workflow where a student would create the mathematical expressions in FX Equation and the copy the result to their software of choice, possibly a Word or LibreOffice Writer document. In my experiments, this seems like a viable approach for writing mathematics with common applications. Overall, FX Equation seems like a nice option and also has a free trial period of 30 days that you should use to try it out. 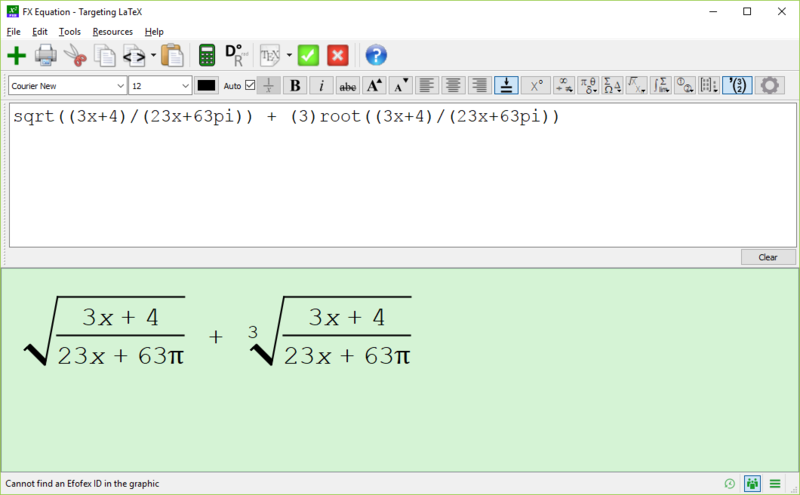 Another interactive equation editor that should be useful is the one that comes with LibreOffice called LibreOffice Math. 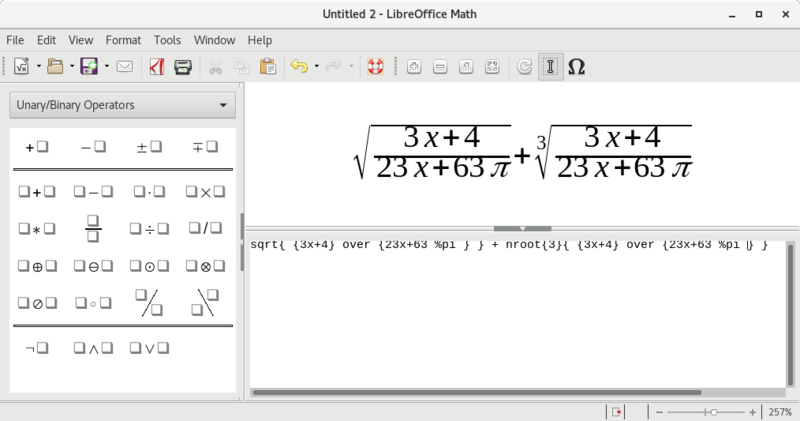 LibreOffice Math like FX Equation and other similar tools, enables a person to interactively create equations and mathematical expressions without performing the calculation for the student. It looks like the software can create a very wide range of mathematical expressions, from simple arithmetic to calculus and set theory, among others. A point-and-click interface as well as a text-based interface are available for creating expressions and, like FX Equation, the results are displayed as they are being built. 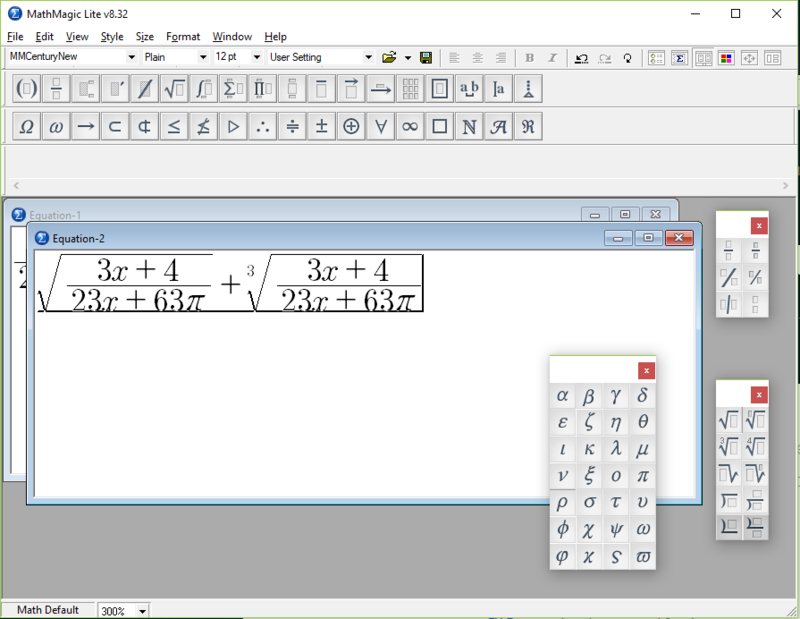 Since it is built into LibreOffice, LibreOffice Math can be executed when editing word processing documents and presentations. It can also be used as a standalone tool. Below is an example of using the tool to create a simple mathematical expression. One downside that I haven't explored is that it really is tied to LibreOffice and it wasn't clear to me how it could be used for generating information of other applications or the web. My guess is that there might be some way of doing this, but FX Equation seems to be much better in that respect. Additionally, it seems like FX Equation is probably a bit simpler when it comes to typing in mathematical expressions, though, the LibreOffice Math language for creating mathematical expressions is not much more complicated. Overall, it seems like LibreOffice Math is a reasonable alternative to other tools, is free, and is fairly powerful. Another tools that can be used to create mathematical expressions is MathMagic Lite and its related family of products. Like FX Equation and LibreOffice Math, MathMagic Lite and the more full-featured MathMagic products support a complete range of mathematical expressions - it is very sophisticated. MathMagic Lite supports Windows, Mac, iOS, and Android and is available for these four platforms free of charge. Unlike FX Equation and LibreOffice Math, the MathMagic series of applications appear to only provide a point-and-click interface for creating equations, though, there might be some keyboard shortcuts for creating more sophisticated expressions just from the keyboard that I am not aware of. You can use the keyboard, though, to enter basic arithmetic expressions and can use the arrow keys to navigate through the equations, which has been intuitive to me. One of the features that I really liked about MathMagic Lite is the ability to bring up the various menus as floating palettes or windows, reducing the number of clicks required to create expressions if you need to use the symbols repeatedly, as seen in the screenshot below. Like FX Equation, it supports many output types even in the "lite" version. If you do a "Save As", MathMagic Lite can create Windows Metafile images (.wmf), bitmaps (.bmp), JPEG images (.jpg), Portable Network Graphics images (.png), GIF images (.gif), Scalable Vector Graphics images (.svg), AsciiMath format files (.txt, ,.amath), Speech Text format files (.mathtxt), and MathMagic format files (.mmf). The more full-featured versions of MathMagic, like MathMagic Personal Edition for Windows and MathMagic Personal Edition for Mac, support a very wide range of copy and paste options into applications like Google Docs, Wolfram Alpha, LaTeX, and MathML. The free "Lite" versions of the software are worth trying out to see if they meet your needs - I have tried the Windows version. The "Personal Editions" seem to be relatively affordable as well at around $70 as of this writing. Another Efofex Software product is FX Draw. Like FX Equation, FX Draw is intended for teachers to create mathematical drawings for instruction, tests, classwork, etc. While it has a few features that automate graphing, it also has a number of features that could be used to create graphs by hand, which seems like it might be useful for math students with dysgraphia. Further, it can be used to create an axes graphic that can be placed in other documents and allow students to draw over the graphic to create various plots. For instance, something like LibreOffice Draw could be used to draw lines and other figures over the axes graphics exported from FX Draw. Another issue that can be challenging is actually performing calculations for other classes (such as science classes) without writing things out on paper. Below are a few things that I believe may be helpful. I have a daughter that has had similar problems writing out mathematical expressions and computations as my son, who has dysgraphia. When she took physics this year, I noticed that she did not tend to writing things out on paper, but would try to do as much as she could with a hand calculator and in her head, an error-prone process. While I was searching for things for my son, I ran across Microsoft Mathematics, which provides an advanced scientific calculator that provides a reasonable method for a student to type in the expressions to calculate, reuse the expressions, assign values to variables for easier calculation of complex expressions, solve equations, plot functions, and convert values between various unit systems. When you type in a complex expression into a calculator, it can be hard to really check that you calculated the correct thing without repeating the calculation multiple times. With this software, it seems like it is easier for my daughter to track down mistakes and quickly recalculate things or, for that matter, avoid the mistakes in the first place since it is easy to read and modify computations as you enter them. Another tool that shows promise in helping document and calculate answers for science and other assignments is Jupyter, a notebook system that lets you mix text, computations, graphics/plots, and more to record computations in a shareable, reusable format. This might be more for advanced users, but I could see how this might be a great way to do homework in an organized way digitally. For example, when I have helped my daughter with her physics homework this semester, I used Jupyter notebooks to write out the computations in Python, using variables to capture the value of parameters in the problems and then expressing the computations more symbolically using the variables. Because you can interactively edit the computations, it was easy fix errors, copy or otherwise reuse computations. The notebooks can be saved individually, so you can go back and review assignments and even share them with others. To see how to install Jupyter, see the installation guide. Jupyter can be used with languages other than Python, including Julia, R, Ruby, node.js, Go, and others. LaTeX can be mixed with Markdown to write documentation on the calculations and might be another way to write out calculations by hand for homework. In particular, the LaTeX output of FX Equation and other tools described above could be used directly in a Jupyter notebook. To see some interesting examples of what can be done with Jupyter, you can examine the examples in this gallery. There are many other resources on the Web discussing how to and why to use Jupyter.